You may be waiting until December 21 to celebrate winter but if you’re meteorologically oriented, now is the time to break out the hot chocolate and ugly sweaters. Meteorological winter officially kicked off this week with a bang in California, providing some much-needed rain to start the wet season there. And over the next 6-10 days, the majority of the U.S. is likely to experience some unseasonably warm temperatures according to forecasts from the National Oceanic and Atmospheric Administration. In the big picture, the U.S. has seen a number of climate shifts in the cold season over the past 40 years or so. 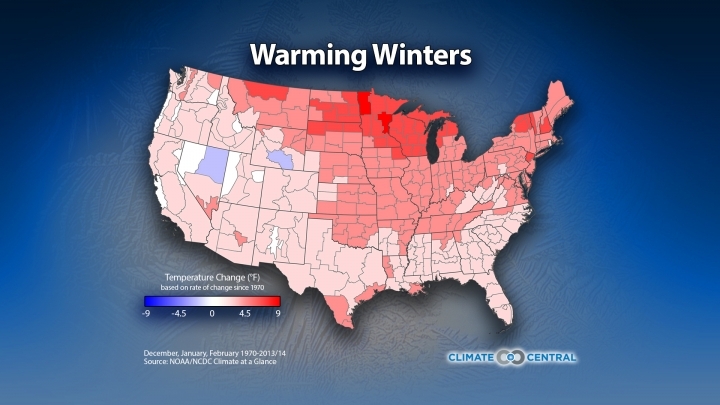 Since 1970, the average winter temperature in the continental U.S. has warmed by 2.4°F since 1970. That’s faster than the planet as a whole, which has warmed 1.1°F over that same period, due in large part to rising human greenhouse gas emissions. Within the country, certain regions have seen heat crank up faster still. 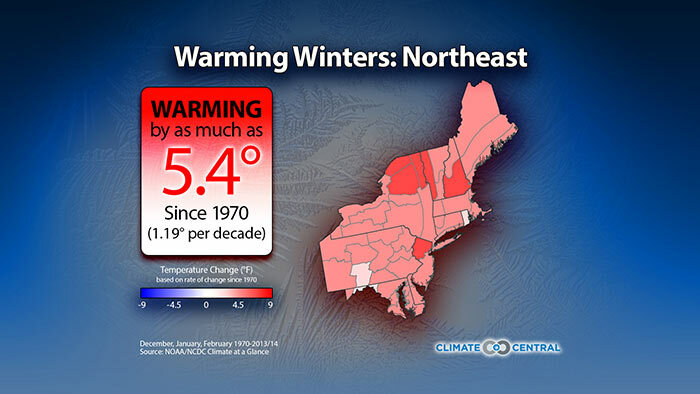 The Upper Midwest leads the charge as the fastest-warming region followed by the Northeast. The South and West, by contrast, have warmed relatively slowly. The only notable cold spots are in eastern Nevada and southern Wyoming. How are winters changing in your part of the country? When it comes to precipitation, it’s more of a mixed picture. A large swath in the middle of the country from Texas to Michigan has seen an uptick in precipitation. The Rockies have also gotten wetter, which is good news to skiers (though that's tempered by rising temperatures). At the same time, the Southeast and Northwest have gotten somewhat drier. 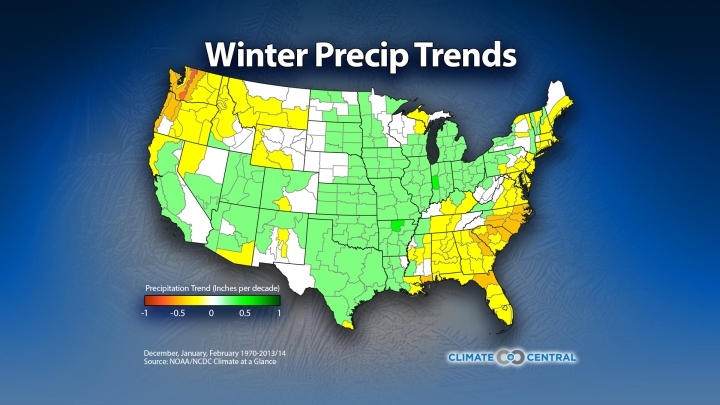 Interestingly, considering the current drought afflicting California, the long-term trend shows that winters have gotten wetter in a large chunk of the state. This wet season appears off to a better start than the past two, but with record heat baking soils to their driest levels in at least 1,200 years, a lot more rain is needed this winter to bust the drought.